Many of you probably grew up wishing you could own a Porsche 911 or Ferrari Countache. I grew up in Japan in the 70’s and 80’s, so one of the cars my friends and I lusted after was the Nissan Fairlady Z (sold in the States as the Datsun 240Z). 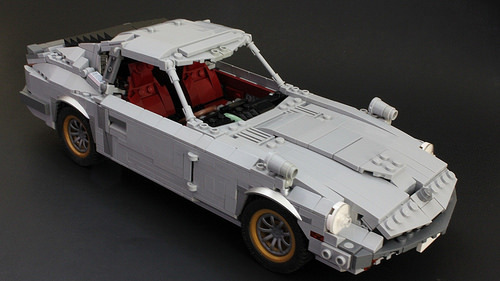 Cagerrin has manufactured a highly detailed Fairlady with opening doors and a detailed interior. The gold rims and red seats add pops of color to the gray/silver car, and I love the use of buckets for the rearview mirrors. Check out Cagerrin’s photoset on Flickr for more views, as well as digital designs. As for the Ferrari, we were all lusting after the Testarossa. Then there were those of us trying to be more refined and unique and hanging posters of DeTomosa Panteras in our bedroom.